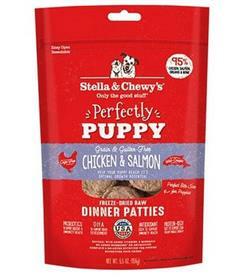 Help your puppy pal reach her optimal growth potential with Stella & Chewy's Perfectly Puppy Chicken & Salmon Dinner Patties Grain-Free Freeze-Dried Dog Food. These dinner patties were crafted with the philosophy that our furry friends thrive on the same diet they would eat in the wild, which is why they are made with real cage-free chicken and wild-caught salmon! High in protein, this recipe is made from 95% meat, organs and bone that has been finely grounded, so your pal can safely get the nutrition she needs to support lean, healthy muscle growth. Best of all each freeze-dried raw patty contains probiotics to support digestion, antioxidants to support immunity and DHA to support you buddy’s brain development! Formulated with added vitamins and minerals, this recipe is made with 95% cage-free poultry, organs and safely grounded bone, to provide your puppy pal with the nutrients she needs. Grain-free, all-natural and minimally-processed puppy food contains no added hormones, antibiotics, grains or fillers. Includes nutrient-rich superfoods including chia seed for healthy skin and coat and overall outstanding nutrition and New Zealand green mussels for superior joint support. A raw diet may help support healthy digestion, strong teeth and gums, vibrant skin and coat as well as stamina and vitality. Every small batch is proudly made with responsibly sourced ingredients in Stella & Chewy’s USA-based kitchen. Ingredients: Chicken, Salmon With Ground Bone, Chicken Liver, Chicken Gizzard, Pumpkin Seed, Organic Cranberries, Organic Spinach, Organic Broccoli, Organic Beets, Organic Carrots, Organic Squash, Organic Blueberries, Chia Seed, New Zealand Green Mussel, Chicken Cartilage, Potassium Chloride, Dried Kelp, Sodium Phosphate, Tocopherols (Preservative), Choline Chloride, L-Carnitine, Turmeric, Sea Salt, Dried Pediococcus Acidilactici Fermentation Product, Dried Lactobacillus Acidophilus Fermentation Product, Dried Bifidobacterium Longum Fermentation Product, Dried Bacillus Coagulans Fermentation Product Zinc Proteinate, Iron Proteinate, Taurine, Calcium Carbonate, Vitamin E Supplement, Thiamine Mononitrate, Copper Proteinate, Manganese Proteinate, Sodium Selenite, Niacin Supplement, D-Calcium Pantothenate, Riboflavin Supplement, Vitamin A Supplement, Vitamin D3 Supplement, Vitamin B12 Supplement, Pyridoxine Hydrochloride, Folic Acid.